Pilates did not even enter my mind as something I might enjoy until nine years after my severe brain injury. Since I began Pilates almost three years ago it has become a part of my everyday life, a part that holds my mental interest and improves my physical abilities. Prior to my brain injury 11 years ago, I had always been involved in sports and really enjoyed being physically active. I played water polo in St. John’s, NL and at Queen’s University, had biked across Canada, and had recently begun racing triathlons. My brain injury occurred on a Friday bike ride around Victoria, BC, where I was doing my Master’s of Public Administration at the University of Victoria. My crash, head first into a tree, shattered my helmet and sent me into a coma for two weeks. Six weeks later, I went home to St. John’s to be close to family, but remained in hospital. My injury had left me without the ability to walk. After extraordinary work by physiotherapists and almost two years doing little other than physical rehabilitation, I was able to return to Victoria without a wheelchair or a walker and complete my Master’s. I worked in Ottawa for three years then moved home, and two years later I began attending Pilates classes. Without help from incredible doctors and physios I would not be walking, and without Pilates I would not be able to push myself physically the way I now can. Since my brain injury and rehabilitation, I have been swimming and I have been walking a lot (often too much). My Pilates training, the focus on technique, and the simplicity of the body’s movement mechanics behind it have encouraged me and given me the confidence to believe and know that my own movement will be more balanced, efficient, and stronger. I owe it to my amazing Pilates instructor, my teacher training instructors, and perhaps most of all, to my sister, who after years of suggestion, finally got me to try Pilates. I’ve been hooked ever since! Pilates had helped my movement so much, and after spending so much time doing physiotherapy, I knew how important strong, efficient movement and balance were to my recovery, and how important they are for any recovery. After I had been doing Pilates for almost two years, I stopped working so that I could write a book about my experience with my brain injury and cross-Canada bike trip, Detour. I then decided that I wanted to be more involved with Pilates so I asked my instructor, Sarah, for suggestions. Sarah had done her teacher training at Body Harmonics and she recommended that I attend teacher training sessions at their studio in Toronto. As I live 3000 kilometres from Toronto, it took some planning, but my interest and excitement about teaching Pilates did nothing but increase. I began with a couple of training sessions in January and completed the rest of my teacher training in June 2014. The logistical side of doing teacher training in Toronto was simply a matter of luck. My sister, a few really good friends, and a few cousins live in Toronto, so I had people to see and places to stay. I had been in Toronto many times before so I know how to get around the city. Nevertheless, Toronto is expensive and I had to spend a few nights in a hotel — although I now walk a lot, it’s still difficult for me to get around (especially in winter) so proximity to the studio was important. I ended up taking two teacher training modules through private instruction, and two with the group, over a total of 3 weeks in Toronto. The four group sessions of teacher training modules were spread out over 6–8 weekends, so although the private teacher training cost more, taking all other costs into account (transportation, hotel, time), it actually turned out to be less expensive than either staying in Toronto for the full 6–8 weeks or flying back and forth for the weekends. I now teach a mat class at Sarah’s studio in St. John’s! I have also been helping the studio set the ground work for new classes for those with neuromuscular conditions like Parkinson’s, MS, and brain injury. I will be assisting in these classes when they get going. It’s very gratifying to know that people are coming to my class because they see the importance of moving with ease and power. Even knowing the difficulty I have in moving around, they would like me to help them with their movement. That’s great! What’s even better is seeing clients leave the studio with smiles on their faces, and when they tell me how great they feel after class! Nick Mercer has a biology degree from Queen’s and a Master’s of Public Administration from UVic. He was severely brain injured in Victoria in 2003. After a two week coma and a lot of rehab (primarily physiotherapy), he finished his Master’s. Nick then worked in Ottawa for three years and returned home, to St. John’s after that. Once he began practicing Pilates, Nick felt how much it helped him. He decided to complete his Pilates teacher training at Body Harmonics in 2014. 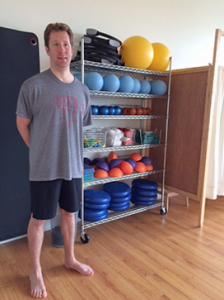 He is now involved in the development of Pilates classes for clients with Neurological conditions at Pony Locale in St. John’s, NL. Nick writes a blog, Concussion Talk, about brain injuries, and wrote an ebook, Detour, about cycling and brain injury. I also suffered a brain injury in Victoria, same year. Probably not as severe as yours, yet still so many of my pathways and brain maps were affected. Pilates – is what healed my body and mind. I would be interested in reaching out and comparing notes. I also looked at many of the videos in your links and they were most helpful in providing information that was not really shared with me at the time of my injury. Thanks for sharing. I began Pilates in 2012, almost 9 years after my brain injury. It has made me more stable and stronger in my core. Those were the big areas of improvement, but the most noticeable change for me (my balance and walking were the areas my injury affected most) was my more efficient muscle recruitment, and understanding (subconcious and concious) of what muscle I need to activate to correct balance and movement. What have been your challenges? How has Pilates helped you? For the past 5 years I’ve been writing a blog http://www.concussiontalk.com and I’ve also written an ebook, Detour https://leanpub.com/detour about my experience, before and after my brain injury.